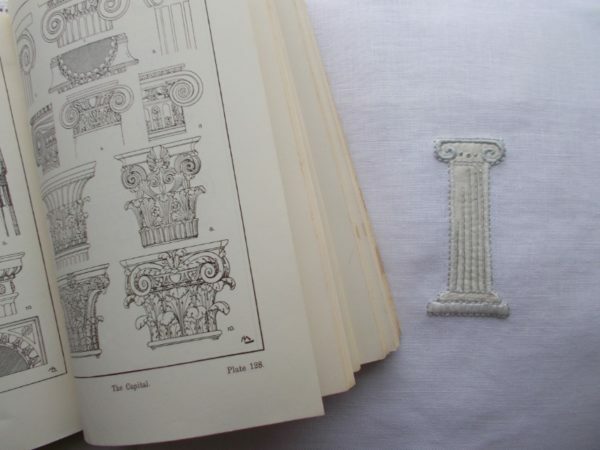 For me blogging is primarily a mini essay attached to a bit of embroidery. In the short term, family can dip in to find out a bit about my week, while in the longer term I like to think my grandchildren might find it interesting. Unsought bonuses come when people like school friends or former neighbours get in touch or, like this week, when I took up the offer of having coffee with someone who had invited me when first we came to Cheltenham. With volunteering at The Wilson (Cheltenham Art Gallery and Museum) and being a trustee at the Holst Birthplace Museum, my husband gets out and about much more than I do. He is forever bumping into people he knows – whether from 40 years ago or from yesterday. Sometimes he even bumps into people he didn’t know he knew, which happened on the day he was walking through the upper floor of the museum’s coffee shop with one of the museum’s curators (except they’re called cultural producers now! ugh!) His companion stopped to talk to a group of women knitting and, being a people sort of person, he joined in too. Imagine his surprise when someone asked “Are you David? Clever woman, from a walk on, speechless, non visible part in a minority interest craft blog she had identified the man before her as my husband… Since that day, he’s met her several more times in The Wilson and last week I felt it was about time for me to take up her offer of coffee before I she thought I was incredibly rude. Of course, we got on like a house on fire, talked about family (both had 3 daughters – not to forget my son Alex), working in libraries (both done that ), moving houses (we’d both done too much of that), losing treasured things in the moves (both done too much of that too) and that was even before we got on to knitting and what we liked about the museum, the cultural scene and Cheltenham in general. Three and a half hours later, having passed judgement on numerous common family conundrums, drawn in Ben for a chat (he runs art classes in the museum), given the thumbs down to several autumn TV dramas and wavering uncertain thumbs up on others, we thought we should go home. And all that from this little blog. Remarkable. We shall meet again. 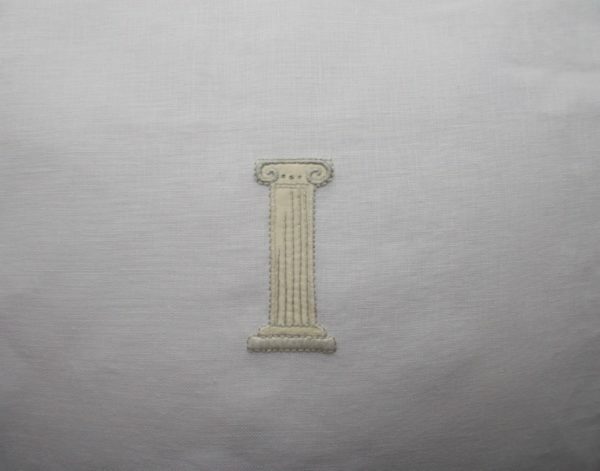 This week I have embroidered an I which is a difficult letter to make a lot of with its simple straight up and downness and general lack of curving lines of beauty. 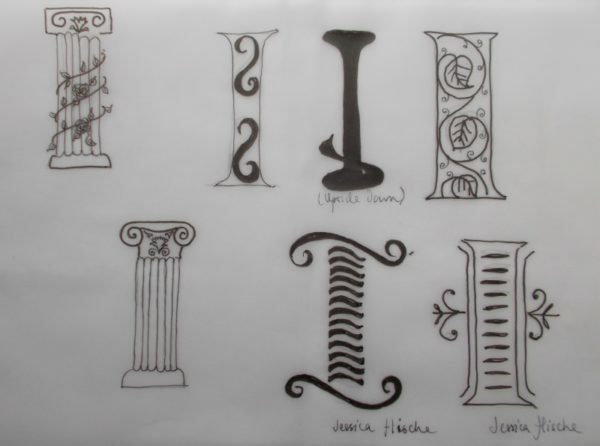 Names like Imogen, Isabella, Iona, India and Ianthe are gloriously beautiful but somewhat disadvantaged in the monogram stakes by that uncompromisingly uncomplicated initial letter. Reaching into classical architecture for a column seemed the only way to unite elegance and beauty, though now I’ve done it, I find something sad about a single column on its own…If you ever want lots of details on all sorts of ornamentation, the Dover publication shown below is worth seeking out. My blog has found me a few random friends, too – and my husband also met one of them before I did…! I understand what you mean about the lonely column, but I like it very much, even so! What a coincidence – or perhaps it happens to all bloggers, you never know! I like the column idea. 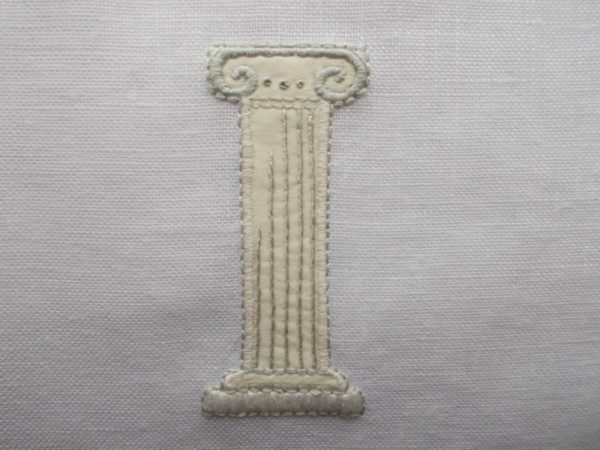 Oone could do uncompromising doric columns or flowery corinthian columns depending on the personality of the recipient of the monogram. I’m not sure about individuals both of whose initials are I.
I enjoyed your previous post as I always found your blogs from Ipsden delightful. Your late friend does sound “Best of British”. There seemed to be many when I was young, I hope the breed has not totally died out. 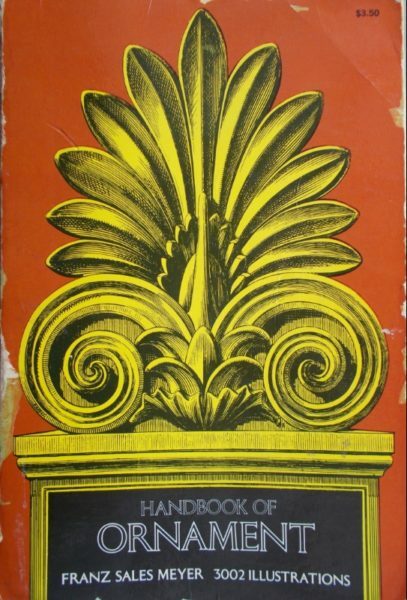 Yes, Anne, though after I got the reference book out I decided to go for something much simpler which just nods to the Ionic order. I’m afraid I do think the breed is dying out, though now I come to think of it my son-in-law has something similar about him – in a different sort of way, that is. Oh dear, I may well be making him wince when he reads this – which, beyond all notions of loyalty, he does!! Serendipity at it’s best Mary! I had such a fun morning with you (so many things in common!) and hope it was the first of many still to come. Go well, hope to see you soon, Sue. I enjoyed it very much too Sue. Thanks so much for getting in touch when we first came to Cheltenham. I wish I’d taken up the opportunity to meet earlier. We will do it again. How lovely that you met a friend through the blog. I have been quite fascinated over the several years I have been writing mine, having been drawn to blogs and bloggers that i really feel an affinity with, and I do wonder how on earth that happens? Having been away from blogland for a while i didnt realise you were living in Cheltneham. A new(ish) medium like the blog takes time to evolve a code of use. I agree that you can feel you get to know people who comment quite well, so it’s vry heartening to meet people and to find they are really kindred spirits. It often makes me sad when one suddenly stops and I become insatiably curious to know what has happened.